Essential oils have been utilized for centuries to treat wounds, ailments and enhance beauty. Different oils contain specific properties that make them unique and extraordinary. Let’s break down a few of my favorite essential oils for acne. The benefits of tea tree oil are countless, but when it comes to treating acne and oily skin, we’re all about its zit-fighting antibacterial properties. This means tea tree oil is also a great choice to treat minor cuts and scrapes. Lavender essential oil helps heal skin irritations and can be used for all skin types. It can cleanse cuts and scrapes, and also calm down stressed skin. Acne is usually accompanied with redness, inflammation and irritation, all treated with this powerful essential oil. Acne and large pores can be difficult to treat, and lemongrass essential oil is highly effective for both conditions. Lemongrass can also be used as an astringent, skin toner, and is great at enhancing skin’s glow. 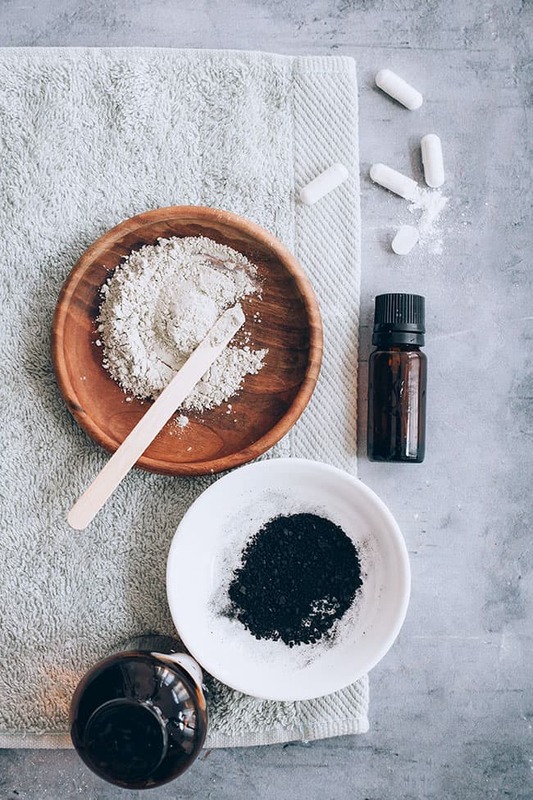 Combine activated charcoal, clay and probiotic powder in a small bowl. Add ACV to make a paste. It’s okay to use more, if needed, to get a smooth paste. Add essential oil and stir. With clean fingers spread over face and let sit for 15 minutes. Rinse with cool water and apply moisturizer.